Mrs. E.’s birthday is today. She never asks for anything. Ever. Well, once. And I had to sell some stock to buy it, but we couldn’t do without Lulu, our zebra rug. This year she asked for a metal toolbox. No. Her parents can buy her a metal toolbox. I refuse. “Oh, thank you,” said Mrs. E. casting a wary eye on the blue box with the Golden Fleece logo. A smile and a dubious look, but a I got a thank you kiss. “They come in four different fits, this is the second most tailored,” I stammered. 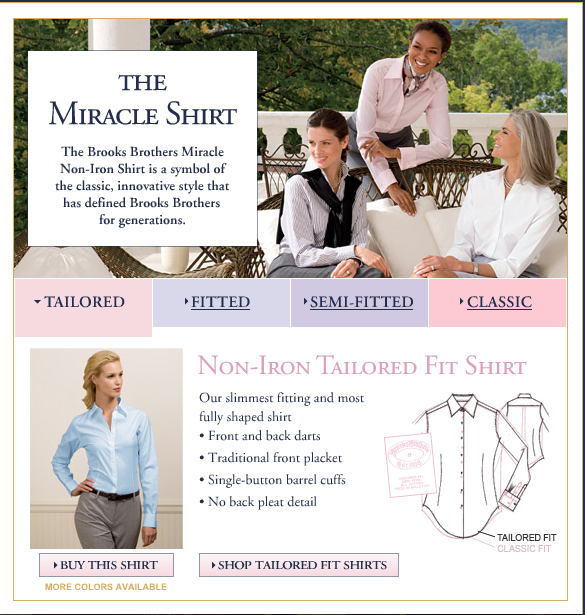 And with that Easy and Elegant Life hereby unreservedly recommends The Miracle Shirt by Brooks Brothers. Even for those women who hate both shopping and expensive clothing. It comes in blue, pink, striped and plain. Goes with jeans, skirts, suits, sweaters… you name it. But a perfect white shirt is where you should start. And as long as you’re there… I hear the made-to-measure men’s clothing is nice, too… . This entry was posted in Elegantology and tagged brooks brothers, Foyle's War, The Miracle Shirt, Women's tailored clothing.. Bookmark the permalink. Thank you so much for the recommendation. I have eight white shirts in my closet – but none could be classified a “miracle”! I am guessing that the miracle here is that it does not have to be pressed? Yahoo! I am all for that, as I have numerous wonderful white shirts, pleated, tucked, ruffled, tailored, with and without bows, covered buttons, mother of pearl buttons, hidden buttons, sleeveless, long-sleeved, peter pan collar, point collar . . . all of which require fairly tedious ironing. I generally don’t mind ironing, but there is simply not enough time in the course of a week to dedicate to wardrobe maintenance. These sound wonderful for traveling! My wife has been dropping some not so subtle hints that these would be a wonderful “surprise” gift. Thanks for the review, she may soon be getting blue box herself, just because. So glad she liked them – I practically live in them. All white, naturally. And, it’s not just the no iron (I do press collar and cuffs even when I pull them straight from the dryer) it’s that they stay so crisp all day. Paula, I think it’s the cut as well. The shirts are very nicely shaped and feel better than the men’s no-iron version which is a bit stiff to my hand. Mrs. B., you were much in my mind as I purchased thee shirts. I think you were the first to tell me of them and I regard your opinion on white shirts highly. Sounds like Paula might give you a run for your money! Funny! I was in Brooks Brother’s last week and saw the shirt and had to try it on. Not only is is made with exquisite detailing but it’s only $89. Not cheap, but actually attainable! These shirts are great- but I admit to touch-ups! I have the French cuff and the button cuff~ there’s a light-baby blue and white stripe that’s perfect for warmer weather too. I always allow a bit of time in my rounds to peruse the sale at BB and lucky me to have found 2 white shirts which are crisp, elegant and perfect for layering. I am on the hunt for a pale gingham check – perhaps you have a source? there is nothing i prize more than a perfect white shirt. …all my life……it is has been an on going quest !!!! Welcome Keb, that must have been a treat! They really are worth every penny, even the very frugal Mrs. E. has admitted as much.